I'm not an early bird and treasure what little sleep I get - they're like golden bits of deliciousness. But, when winter hits and night falls at 4 pm it's time for me to start making sacrifices in the name of stress-relief, and first on the block is the snooze button. Although I'll miss that extra hour of snoozing through an alarm, I know I'll feel better in the long run. 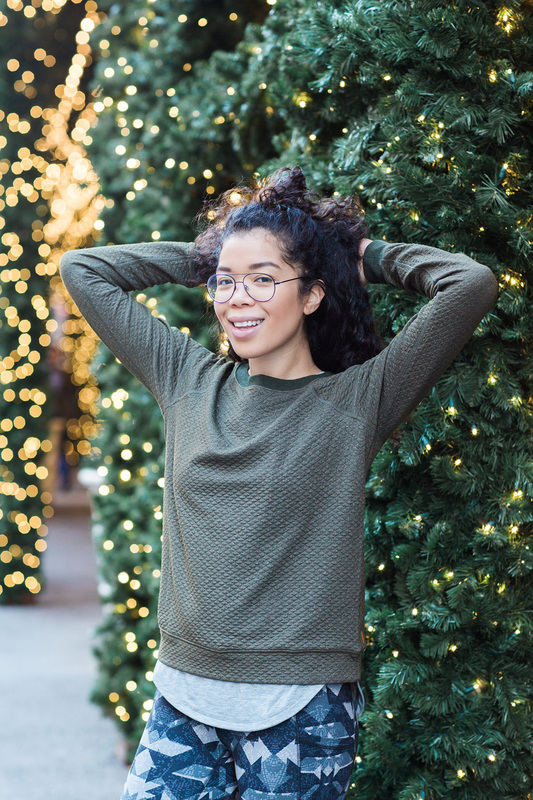 When it comes to me and my winter habits it's important to play to your body's strengths, not weaknesses: I'm more energetic in the morning, running in the dark gives me the heebie-jeebies, and after a long work day I'd rather eat than sweat (must be the hibernation tings). All signs point to rise and grind morning Classpass classes - the early sweat sessions also put me in better spirits too. A few recos on AM class faves: Y7, Mile High Club, & Peleton. I do have a few gripes - finding studios with showers, and lugging toiletries & clothes for the rest of your day. But, with a few months of classpassing behind me here are a few tips and tricks I've learned along the way to make the whole process easy peasy. 1. 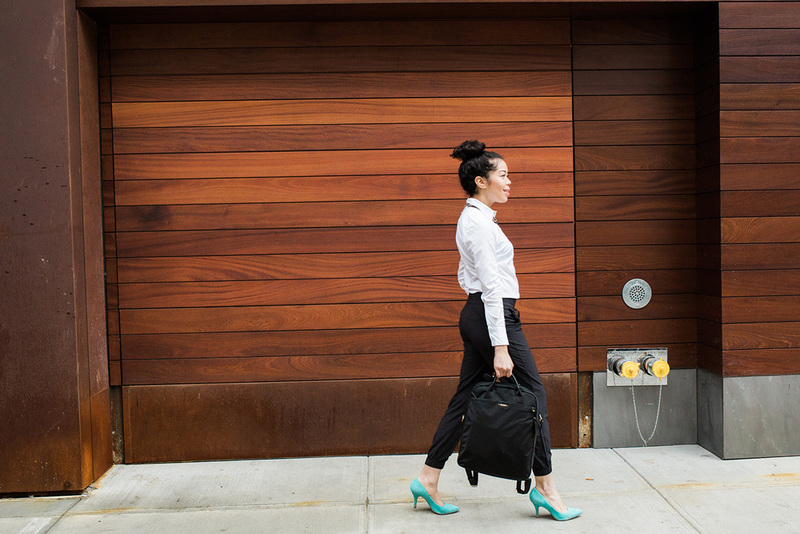 Wear sneakers/shoes that are great for working out and presentable for the office. These all white Theas from Nike (size up!) are so crisp and so perfect for the athleisure trend and my life. Another great option, go for classes that are sans shoes: yoga, pilates, and cycling classes (rent them there). That way you'll only have to worry about one pair. 2. Wear clothing that can take you from studio to street. This is essential if you're trying to minimize the bag-lady look. Lucy Activewear does such a great job of designing clothes for this exact reason. Their team always has us in mind and constantly creates versatile and high-performance pieces. Their winter collection fits seamlessly into my life and the luxe layers are perfect for the busiest time of the year. For this look, I couldn't head into the office with leggings but Lucy does have some amazing pants sans prints. Or, you can follow my lead and pack a midi skirt. 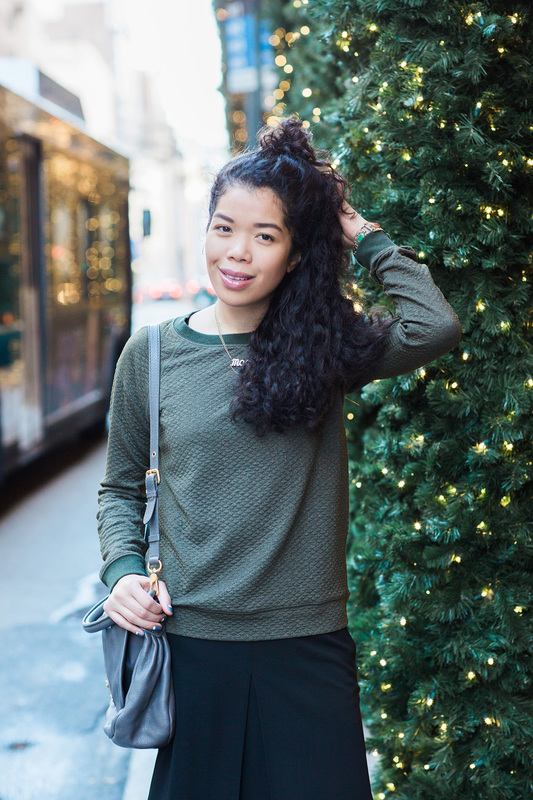 The quilted long sleeve from Lucy is super soft, warm, and appropriate for my office - which I love. 3. Beauty products that can multi-task and come in travel size are a godsend. I've shared my beauty travel bag before here, but my everyday beauty bag carries the true heavy hitters. This might be a post for another day, but my top three products that currently make getting ready a breeze are: Laura Mercier Tinted Moisturizer, Benefit's Gimme Brow (obsessed! ), and PUR's Chateau Cheek Stain. I also spray on Avène Thermal Spring Water pre-glam sesh to rid my face of any exercise-induced redness. 4. When it comes to hair, I just un-bun it and go. If it's one those super sweaty sessions then I'll make sure to spray on this dry shampoo from Carol's Daughter. 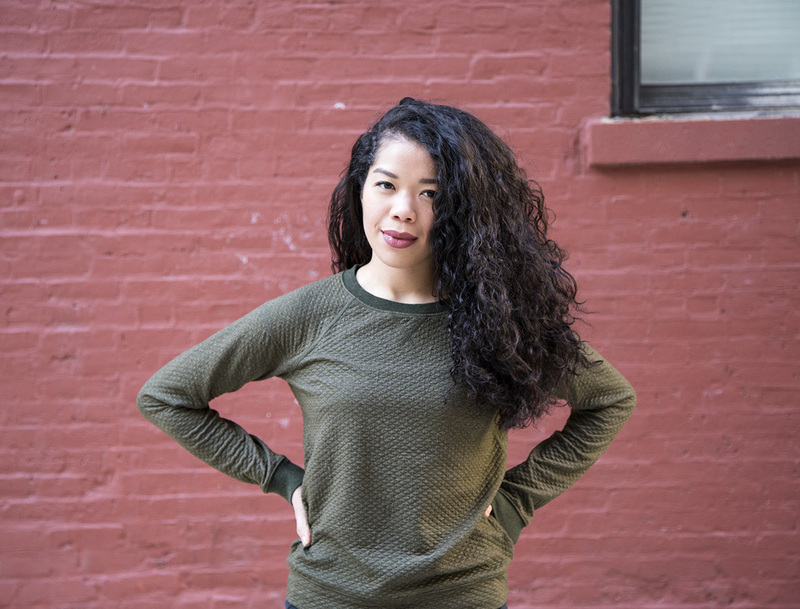 Honestly, though, my curls and I lucked out - the heat & sweat just gives me a better hair day. As we enter the mad rush of the holidays, remember to treat your body right - it's the only one we got. P.s. I created a "Current Sales" tab at the top of my blog. It'll be updated daily with new sales to help you (and me) as we navigate the stores & web during the holidays. I'm almost positive Lucy Activewear will have one so check back on Black Friday! Less than a week away from New York’s annual marathon and the city is buzzing with excitement. Close to 50,000 people head into Staten Island and collectively run together over the Verranzo bridge where they let their strides take them into Brooklyn, Queens, the Boogie Down Bronx, and finally Manhattan. And it’s not only top athletes who take on the 26.2 miles but people with heart who have demonstrated their commitment week after week to get out there and run. Every year, you’ll find me on the sidelines cheering on those that are giving it all because, well… It’s so f-ing inspiring. And next year it’ll be my turn to dash from one borough to the next. I’m so pumped and insanely nervous at the same time. Instead of focusing on my nerves it’s better to go day by day and remember what triggered my elation for those quick swift strides. And you know, share what I learned with y’all. If we were to take it from the start, one of the things that really got me into running was how strong I felt after each run and amazement at how far my body could take me with the bare minimum. Not only that, but it made me feel normal enough to get off my prescribed medication for good (for those that don’t know I was diagnosed with PTSD & anxiety – not a lot of fun). And so, whenever I felt a little out of sync, I ran. If you want to experience that runner's high – I say, try it! You’ll never know until you do. Classpassers (sign up here for $25 off your first month), a few studios that I found to help with my runs were: Mile High Run Club + Barry’s Bootcamp (go faster with their speed runs), Y7 & Tangerine Hot Power Yoga (stretch out those muscles), and Absolution + Flex (a strong core is everything). - Get fitted for running sneakers. Your sneakers can make or break your stride so I highly recommend getting fitted. Don’t go for what’s popular but what works best for you! - Do wear workout gear that makes you feel confident. If you’re a busy bee like me, then look into activewear that can take you from studio to street or vice versa. I’m a huge fan of Lucy Activewear for that sole reason. Plus, their clothes are super flattering, material is amazing, and made for the woman’s body in motion. I started out with one piece their Hatha leggings and quickly added a few more pieces each season as a treat for sticking to my workouts. - Nutrition + hydration are super important. On race weeks (or when I’m really putting in the work) I up the protein intake with a few of my favorite shakes. 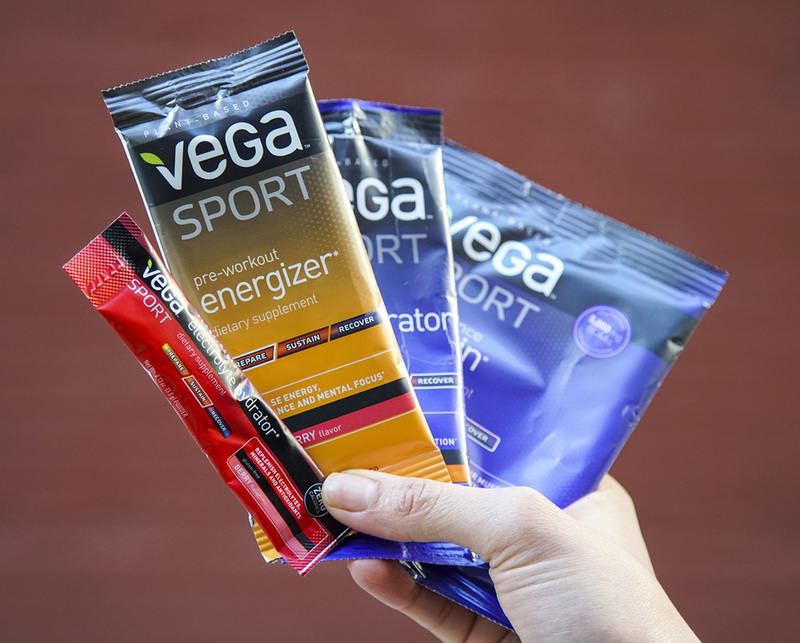 Although I dabble with Sha-Glam and DailyBurn’s FUEL 6, I find myself reaching for Vega Sport. It’s still a plant-based nutritional meal but what I really love is how it divvy ups it’s product based on what stage you are in your training; Prepare, Sustain, Recover. Essentially helps fuel you better. I use their pre-workout energizer before runs and then their performance protein after (if I went really hard). If you’re looking to add this to your nutritional plan, take the quiz on their site to get started. While you’re at – pick up a Blender Bottle for protein shakes on the go! When it comes to hydration, you'll always find me with a bobble water bottle in my hand. It keeps cold liquids cold and hot liquids hot. Give these recommendations a go and let me know how it goes during your next sweat sesh And remember, all that matters is that you put one foot in front of the other when you run. P.s. I took these photos before heading to yoga, hence my casual sneakers. Don't run in casual sneakers - they will kill your knees. On Thursdays (and a few other days that end in ‘y’) I reach for the ultimate lounge pants - sweatpants. Yas girl, we lounging today. Even though there’s no lounging taking place at work, wearing sweatpants anywhere is pretty much THE best. For reference, I sit all day so avoiding that irritating red mark around my waist (maybe I should be pantless?) is kind of key. The only problem I can find (and it’s a pretty big one) is that sweatpants are a huge office no-no. Unless… it’s worn right. I’ve been wearing this Lucy pair particularly to my AM Classpasses and found a loophole that benefits us all. Plus, the fewer things I carry on my commute the less hate and shade I’ll get from other straphangers. (This shirt tends to get a few side-eye rolls but I gotta share the PSA). There’s enough slouch in these pants that I can wear my Hatha shorts (underneath) on the way to class, remove these, and then wear (and relax in) the sweats all day after. If you’re curious, it’s all in the footwear and fabric of what you choose to wear after the sweat session. The polyester material in the pants has a nice sheen that makes them a bit more grown up for the office (keep that in mind when shopping). I also switch out my sneakers (when worn) to a cute pair of heels or booties and wear a white button-down top. This top is my fave since it doesn't wrinkle when packed. I love black & white but it can feel a little school-uniformish, so I went with these blue suede shoes (my tried & true favorite). And of course, a little bit of bling. Also, if you have not tried the Y7 yoga studios around NYC/LA, you should (on Classpass of course). I’ve been hitting their space weekly and it’s such an awesome way to start the day.